SilverFast 8 – Make the Switch! 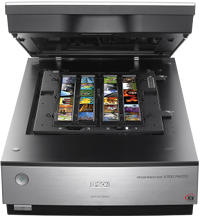 Your Epson V700 Photo achieves significantly better results with SilverFast; for this reason each Epson V700 is shipped including a copy of SilverFast SE. 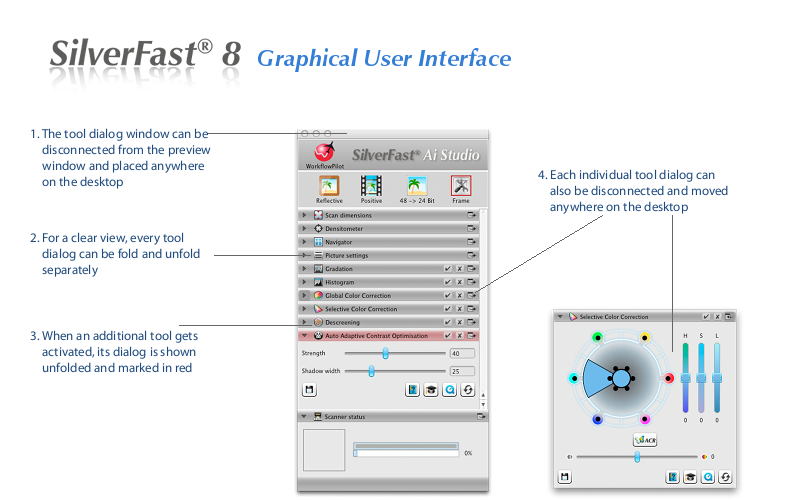 We have now released the very latest version, SilverFast 8. Did you know that you can upgrade to the new version for a discounted price or even free of charge using your current SilverFast serial number? Experience in this newsletter, which features and advantages our new version has ready for you. The completely new developed User Interface, Multi-Tasking and many more functionalities such as the WorkflowPilot will greatly assist you. Therefore – Make the Switch! Find out right now your very special price we would like to offer to upgrade from SilverFast 6 to SilverFast 8 or read more about SilverFast 8 below. Press and Photographers are excited! Will everything be all different with SilverFast 8? Upgrade now at a bargain price! The user interface of SilverFast 8 is newly developed by current standards, for the user can operate all major functions quickly and easily. The graphical user interface also offers the possibility to flexibly arrange the control elements anywhere on the screen to fit personal preferences easily by dragging and dropping using the mouse. This proves especially useful when working with two monitors. In WorkflowPilot mode, the required tool dialogs automatically open in the foreground also showing tips on how to use these tools. (Click to enlarge) The SilverFast Preview Concept allows to immediately see the result of any adjustments made on the preview window itself. 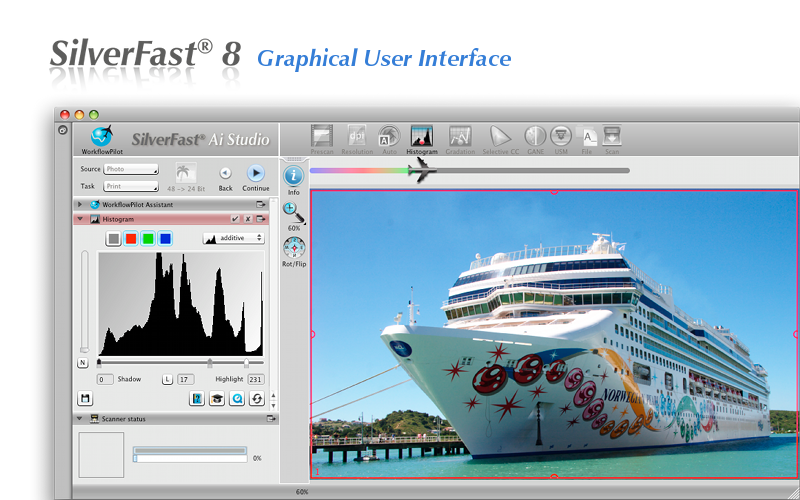 Even the results of complicated image enhancement functions, such as iSRD for infrared-based dust and scratch removal and Unsharp Masking USM, can be shown by SilverFast 8 in advance. No, not really! 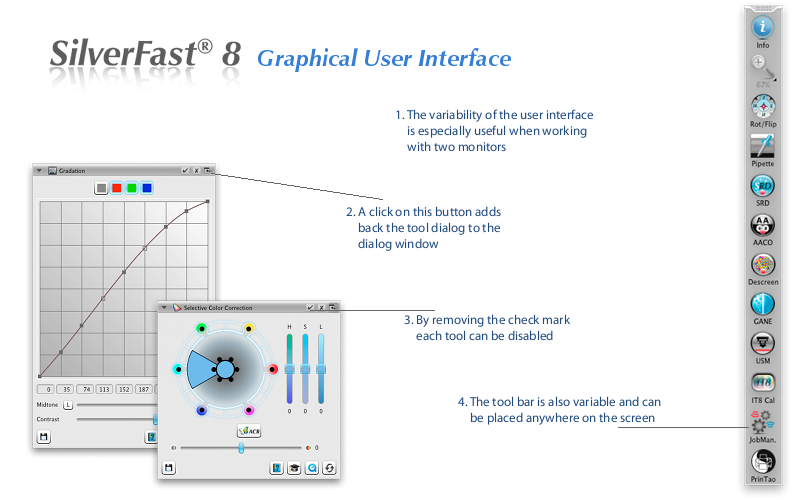 As you can on the screenshots at the right, the graphical user interface has been completely revised for SilverFast 8. This is why everything naturally looks different and perhaps also a little bit strange at first glance. But many of these changes were made to bring substantial simplifications in operating SilverFast. You will soon experience it yourself. 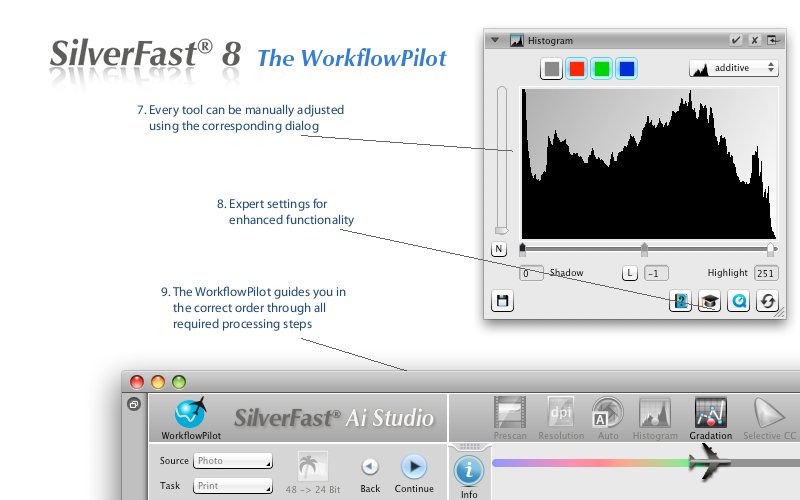 All the features you know from your version of SilverFast are also available in SilverFast 8. In addition, new highlights, which make scanning and image optimization even more easy, have been implemented. 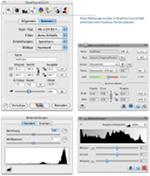 The picture on the right shows a comparison of both versions dialogs for basic picture settings. They are really similar to use. 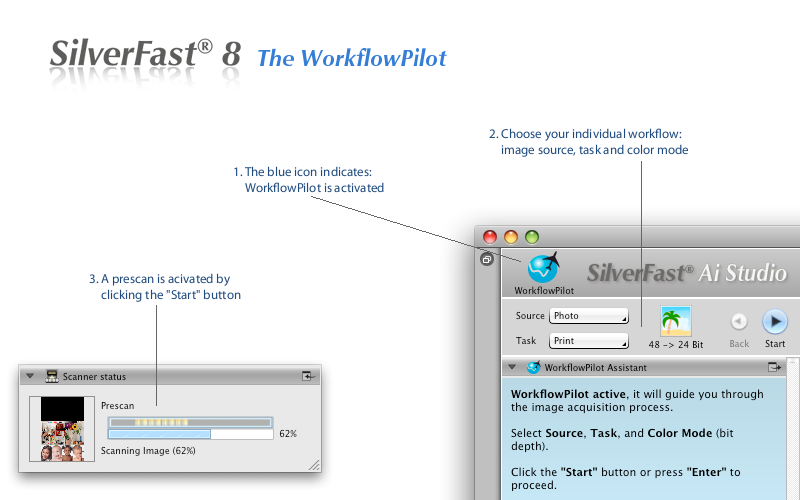 The WorkflowPilot is an essential core element of SilverFast 8. 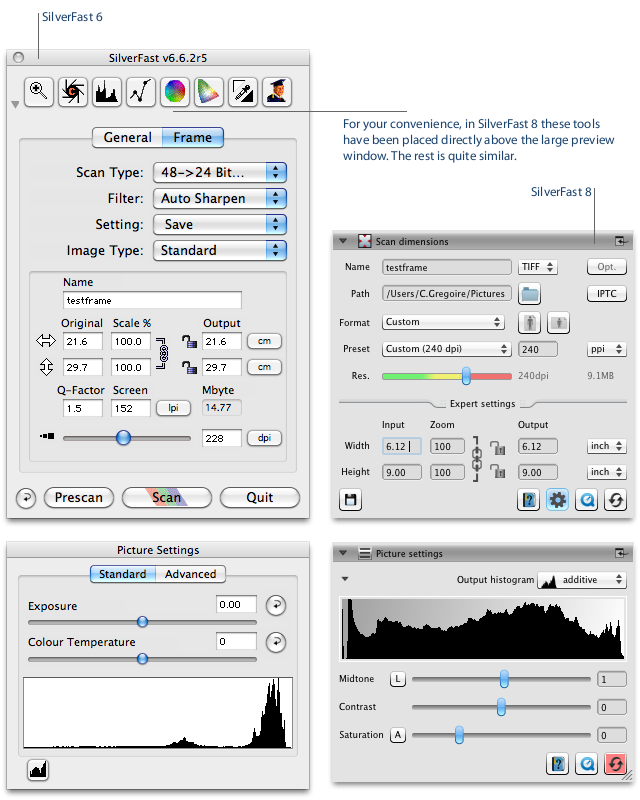 This novel feature, which guides the user as a kind of wizard in the correct order through all processing steps required for his individual workflow, is unique in the world and an ideal tool to learn using the new features of SilverFast 8. 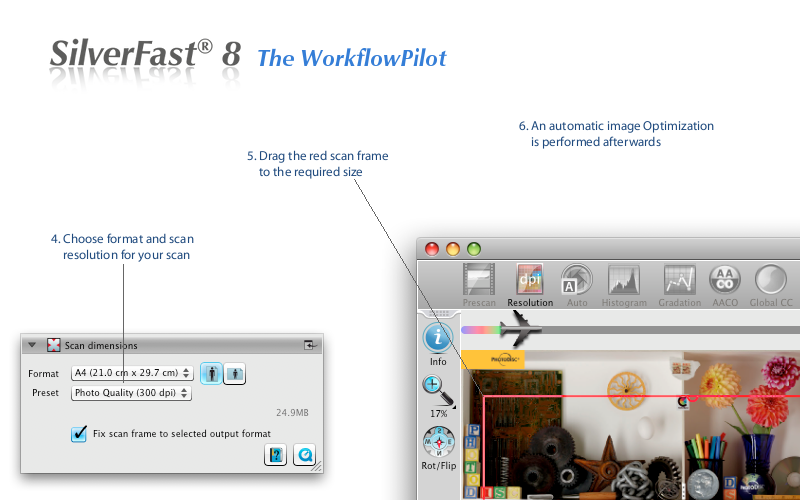 SilverFast Ai Studio 8 provides the possibility to create own workflows. (Click to enlarge) Depending on which material should be digitized for what purpose, there is a different workflow that will be worked on step by step after starting the WorkflowPilot. In addition, the user is supported by the wizard with informational texts and QuickTime movies that are directly callable from the software. The movies are short tutorials showing how to properly use the features. The WorkflowPilot prevents potential errors regarding the order of operation, which otherwise could lead to applying various tools in an incorrect order. Of course, the WorkflowPilot can be turned off completely as well. Click on the thumbnails to get a vivid impression of the new WorkflowPilot functionality. SilverFast 8 is Multi-Tasking capable. Thus, the user is never forced to interrupt his workflow to wait for the scanner or a complex SilverFast calculation. For example, if several originals should be scanned one after another, the user can already set the image optimization adjustments of the second scan, while the scanner captures the first original. 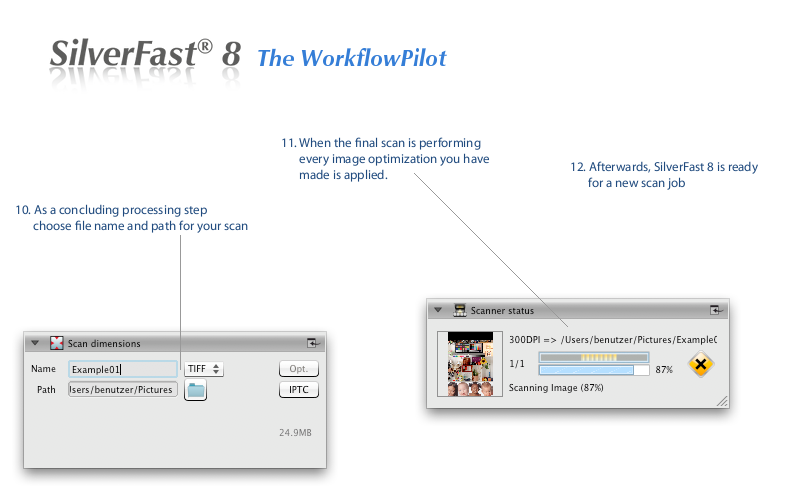 Click the button on the right to view an example movie on how Multi-Tasking can be applied in SilverFast 8 when scanning several slides using a flatbed scanner. 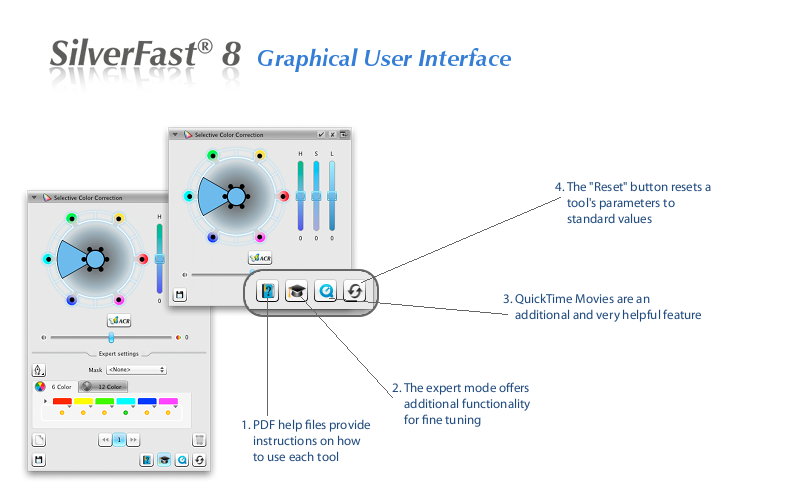 Replace your SilverFast version now and get SilverFast 8. Click the "Upgrade" button to find out if you gain a discount of 20%, 30% or even 50% with your old version of SilverFast. You may even be entitled to receive a free upgrade.